Pyongyang made the threat Monday, several days after Washington and Seoul revealed plans to use the Terminal High Altitude Area Defense system – THAAD – on the Korean peninsula following a series of ballistic missile and nuclear tests by Pyongyang. The location and timing of the deployment have not been announced. Pyongyang’s official KCNA news agency, using its typical bellicose style, said Monday “It is the unwavering will of our army to deal a ruthless retaliatory strike and turn (the South) into a sea of fire and a pile of ashes the moment we have an order to carry it out.” Pyongyang said the “physical response” will take place the moment the time and location of THAAD have been confirmed. China and Russia, as well as North Korea have expressed strong opposition to the deployment of THAAD and urged Washington and Seoul to put a stop to it. South Korean President Park Guen-hye said Monday the THAAD system is only intended as a defensive measure against the North, and is not targeted against any other country. 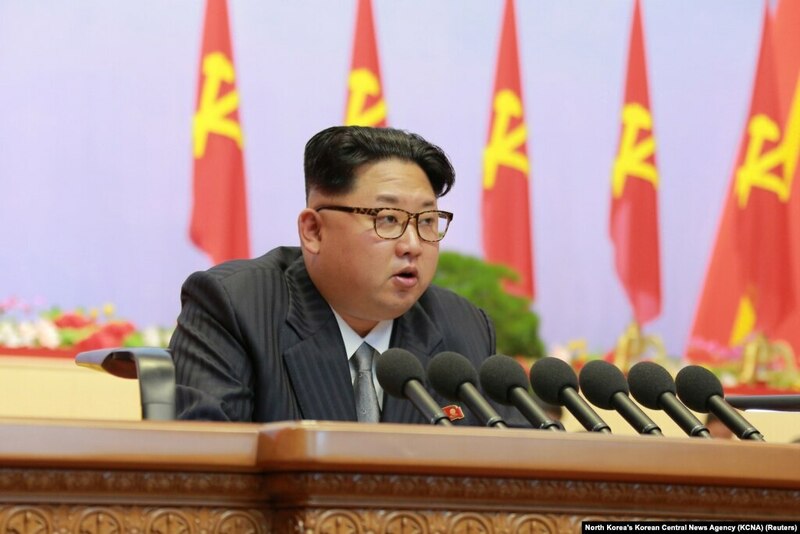 FILE – North Korean leader Kim Jong Un speaks during the first congress of the country’s ruling Workers’ Party in 36 years, in Pyongyang, May 6, 2016. The latest ballistic missile test by Pyongyang took place late last week when a missile was fired from a submarine off the coast of the port city of Sinpo. The missile was reported to have exploded after traveling about 10 kilometers into the air, similar to a failed test in April. Western military officials, however, say Pyongyang’s abilities improve with every test. The submarine missile launch came one day after Washington and Seoul announced plans to deploy THAAD. China, as North Korea’s key ally, has urged the government of President Kim Jong Un to return to international talks and dismantle its nuclear program in return for economic assistance and security guarantees. Pyongyang is already under various U.N. and U.S. sanctions for its nuclear and ballistic missile programs.